Pair this cider with a big, fat ham. The 2017 Darling Creek is defined by the vintage: a cool, wet growing season in which our biennieal bearing bittersweets were in their on year. Biennialism is a concept that does not exist in grape wine making. Deep inside the genetic code of Malus domestica is clever traits to outwit pests…produce little fruit in one year and the insects that eat and lay their eggs in the apples take a population dive. Produce tons of fruit the next year and only a small percentage will be insect damaged. For a plant who’s goal is to reproduce with as many seeds as possible, this trait works well. For a farmer trying to make a living it can be a challenge. Breeding and chemical fruit thinning have all but solved this problem for modern, conventional growers but old varieties, and especially European bittersweets, remain stubbornly biennial. 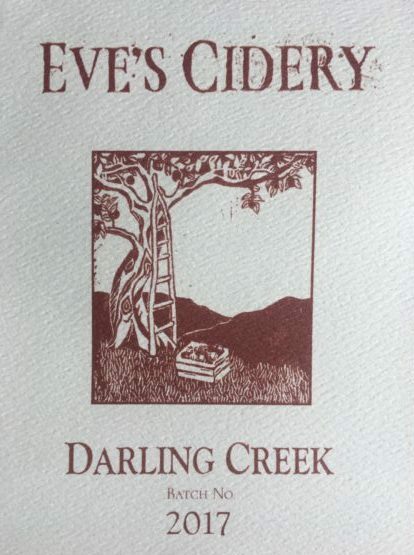 Our vision for our Darling Creek cider is to create a blend out of the ciders of the vintage that has ample tannin, lots of acid and plenty of fruit. In 2017, two thirds of our apples were bittersweets, something we have never experienced before. In March, we tasted through our tanks and with the idea behind Darling Creek in our mind, tried to create synergy out of what the season had given us. This year’s version of the Darling Creek is our most tannic yet. It’s a powerful cider that we think will age well and pair beautifully with rich, fatty food in a way that only bittersweet ciders can. Un-innoculated primary fermentations in stainless steel. Secondary fermentation in bottle, followed by hand disgorging.